Back with another review. Today I'll be focusing on hair. My hair type is straight and super thick. However it's not the stick straight kind that looks nice on it's own. And it's not like some of my friends with beautiful wavy hair who can just wash and go. If I let my hair air dry completely and that's it, i'm left with a big stack of straw on my head. The layers are not defined and it just looks messy. As a result, I like to blow out my hair using a round bristle brush and a blow dryer. The key is to wait till your hair is almost dry and use a heat protectant before doing this. That way, your hair doesn't sustain as much damage. I currently use a Chi round ceramic brush to blow out my hair, but recently http://www.brushlove.com/ sent me one of their new Pure Ceramic brushes to try out. 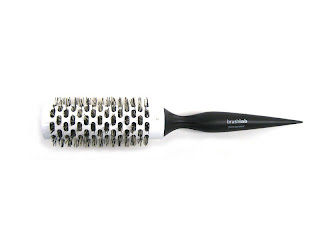 Website description: Ceramic-infused thermal barrel hair brush with heat resistant nylon bristles. At first glances, the brush seemed sturdy and of high quality. I like how it comes with a pointed handle. This helps to part and section the hair. When you wrap the bristles around your hair, the blowdryer heats the core which helps to curl the hair. I tried this on myself and found that the size they sent me was too small. However, the bristles do a good job on holding onto the hair for a good blow out. This brush would be bettter for blowing out side swept bangs or for medium length hair. My hair runs down the middle of the back so I usually need the largest size to get all my hair around the brush. As a result, I just use this brush to smooth back my hair for pony tails. Overall, it's a good quality brush, just make sure to select the right size for your hair length. This brush retails between $9.98 through $11.98 depending on the size at http://www.brushlove.com/ or at Ulta stores nationwide. Use coupone code love30 to get 30% off online orders from Brushlove. FTC Disclosure: This product was provided to me by the company. I am not affiliated with the company or paid to write this review. I have thick and curly hair, but also use a round brush (not the Chi however, just a generic Conair) to dry large sections of my hair after it is about 90% dry from haphazardly blowing the root and length dry. I can straighten my hair in this way in about 5 minutes. I am so glad you pointed out the handle of the brush. I love anything that can do more than just one thing! I just might try it out... thanks! Yay for multipurpose :D!! dBuying a lace wig for the first time can be a daunting process as there is so much choice. This choice is not restricted to finding a style that suits your face as lace wig also vary in construction. The variety in lace wigs enables people to ideally meet the needs of their lifestyle and image.In order to remove some of the confusion often experienced by first time users this article briefly details the differences between Lace Front and full lace wigs.